An enjoyable breakfast with Shane at his homestay began our first full day in Vinales. First up was a walking tour in the nearby National Park in a valley next to the town. There were lots of comments about the weather and how winter here is like summer in most other countries, glad I didn’t come in summer. The walking tour highlight was a visit to a local farm. All farms must grow tobacco and sell a set quota to the State. Any excess tobacco is theirs to sell as is anything else they grow. The farmer is always using the land growing different crops, the warm weather allows for this as the season moves between wet and dry. 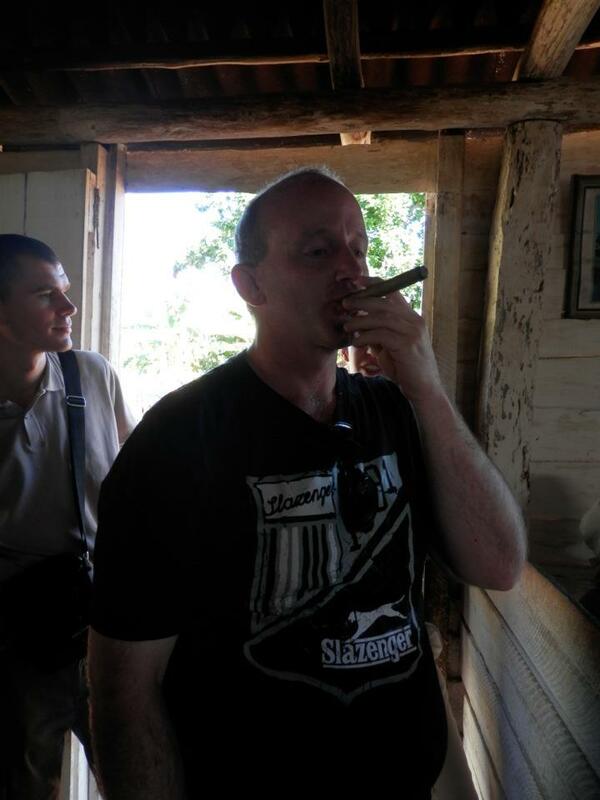 The farmer showed us how to roll tobacco and to make a Cuban cigar explaining the process and the special ingredient he used compared to the Government cigars ie honey. We then got to smoke cigars and have tea (no tea for me however) watching the great landscape and the goat and chicken strolling around. On our hike back we stopped at a local ‘cafe’ basically a place to get alcoholic drinks and sit down. The owner had caught a tree rat to train as a pet. The thing was huge and in a age with looked terrible however we were told they either make them a pet or eat them! At lunch Maggie left with a singer from last night that she hooked up with and is spending the day with. The oldest member of the group proved the most adventurous. This meant we were down a member for our optional cave hike in the afternoon which we almost didn’t get to go because of a lack of helmet lights. The cave hike was amazing. First up you had to be careful climbing up the mountain it was a sharp fall if you misstepped and a good workout. The caves were amazing for example there was a root from one tree that had grown 40 metres in the cave to reach a water source, there was also a formation that looked like a lizard. The moisture inside the cave meant you had to be careful as it was very slippery. At one point our guide played music using some of the formations that were hollowed out very cool. At our deepest point he got us to turn off our lights and just listen to the silence in the pitch dark, so peaceful with no light at all like you are blind.